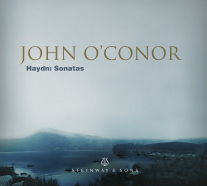 The sonatas of this group all show an assured elegance. Some of them, like this one, have more inward qualities and some of them show a sense of fun characteristic of Haydn. The opening theme swings easily into bravura style music. After a passage of chopping notes played against trills, there is a brief question and answer exchange. The ensuing calmer passage has an insistent rhythm. The opening theme returns. The end, firm yet simple, combines trills over deeper statements in the bass. The slow movement, quietly inward, has a scalar configuration and uses pauses as pivots. The theme, retreating and advancing, unfolds over a gently rocking bass. The last movement has a very assured theme that makes its way with a minimum of fuss. It is a joyous song with bold stitching of chords. There is a slower tempo followed by more intense music that swaggers to a precise end.